I sit in front of a beautiful, very accomplished woman. The sun warms my back; it’s a lovely terrace filled with plants in central London. She runs a successful small company and just won a prestigious award, so we met to celebrate. — Well… I can’t stop thinking about someone I helped today. I don’t want to be this person who expects something… but wouldn’t it be nice to hear thank you from him…? — I am confused… you just won an award for helping many people, and you worry about someone you met today…? — It’s just another award, - she says, - another day, another client. I know it’s great in my mind. But I don’t feel it. I haven’t felt for a long time. I am numb inside. — It’s simple, - she adds, - I can win more awards, but it doesn’t make me happy as nothing I do is good enough. I can’t count how many times I heard this phrase from my girlfriends and women I work with. I can’t count how many times I felt it myself. Why do men don't seem to struggle with this particular problem? In her book "Lean in" COO of Facebook, Sheryl Sandberg mentions amazing research that shows: women will apply for a job if they find their skills match 90% + of requirements. Most men will go for it with less than 60%. As women, we often don't appreciate our own efforts. The reason? We look for fulfillment in a wrong place. We believe "doing" is the answer to happiness, as this is what the world taught us. We try to do more, only to get disappointed again. But if we look at our efforts from a right perspective and stop relying our happiness on it, we can do more and finally feel satisfied with all we accomplish. 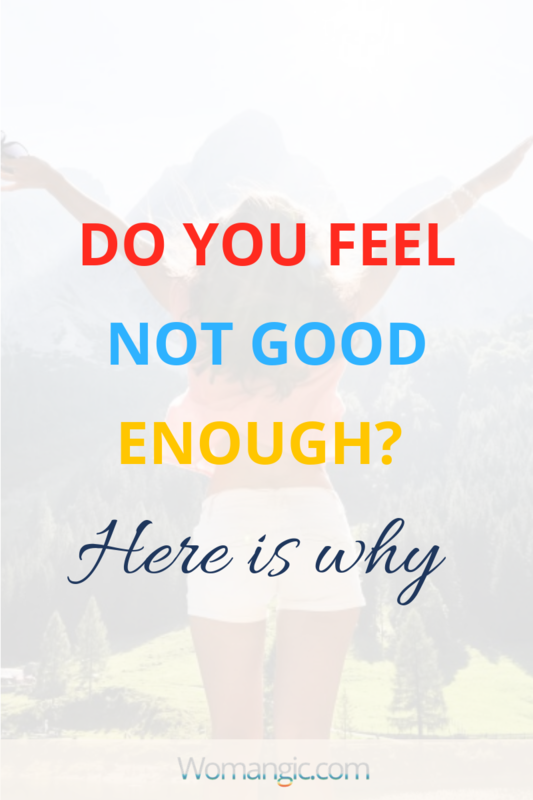 So where do we find fulfillment and how do we start feeling what we do is enough? The life is created by the union of masculine and feminine. They can’t exist without each other. And each of us has both of this energies. Yin and Yang. Left and right brain. Intuition and Logic. Emotions and rationality. Masculine energy is external. Female is internal. We live in a world of masculine energy, agree? So everything external is celebrated: doing, achieving, having particular things at a particular time. These are great, but we grew up to believe it's the only way to happiness. We achieve, work harder, do more. Only to get disappointed as it doesn’t bring us fulfillment. Fulfillment, joy, sensitivity, creativity, connection, intimacy is as natural as life itself. Why do we lose it? As a society, we embrace masculine and tend to suppress female qualities. I know when my dad told me similar things, he only wanted to protect me.... he wanted me to fit in the world, to be able to take care of myself. But what my sensitive Soul heard was: “All your girly things aren’t appreciated here…” And so it goes. We try to be like someone else; we hide, we form the greatest friendships of life and only in a safely of it we allow ourselves to be seen. We try to be more rational, tougher, less caring. We feel too deep, so we try not to feel at all. But when we lose our sensitivity, we lose ourselves. We disconnect from our female nature: joy, intuition, fulfillment, love. If you feel numb inside, it is probably the reason. You stay in your masculine energy all the time and suppress your female side. Being in masculine energy, achieving, working hard is amazing. It doesn't make you lose the joy, happiness, freedom. Suppressing another important part of you does. Disbalance of energies made you believe that your life is as good as the number of things you do. But female, sensitive souls aren't wired this way. No matter how much we push ourselves, we can't find fulfillment in a wrong place. ​​​​​​Achievements are very important; it’s the essential part of life. I am a very ambitious person, and my dreams are so important to me, but I almost lost them, when I believed doing is the only part of my life. Here is the thing: If you have more masculine energy, then achievements can be your way to fulfillment. But if nature granted you with the gift of sensitivity and femininity, no matter you suppress it or not, achievements satisfy you, but not for long. Your way to joy is feminine, it’s tender, it’s beautiful. Your way to fulfillment is being, not doing. Your personal, deep connection with the Universe, people around you, nature. It’s deep, wholehearted connections, it’s compassion, understanding, unconditional love. And we need more of you in the world. Oh, Lord, we do. We need more female strength and power and it starts with accepting that being a woman, embracing female energy is a pride, it’s an honor. And it never prevents you from being accomplished; it helps you with it. I know it’s scary to allow yourself to embrace your feminine side. It takes a lot of courage; it takes lots of healing. But if you’re reading this, you’re ready. Go inwards. Get to know yourself. Start meditating. Embrace your emotions. We have many free healing guided meditations that can help. Choose the one you need most right now, whether it is clearing negative emotions or letting go the past. And you so much deserve it. P.S. You can learn how to feel enough and be confident in S.P.I.R.I.T. Formula Program. S.P.I.R.I.T. Formula shows you how to break the patterns that make you doubt yourself, feel exhausted, unappreciated, give away all your energy to everyone, but yourself. It helps you unleash your gifts, your strength, your power. A program that will open your eyes to your own worth and power, raise your value, forever changing the way you look at yourself, even the way you express yourself and how you expect to be treated. Guided by S.P.I.R.I.T. Formula you will realize your importance on the planet, experience more appreciation, feel peaceful and empowered, connect with your passionate side. S.P.I.R.I.T. Formula has almost a thousand happy students from more than 20 countries. You deserve to live a life you imagine, but how can you create it without knowing you worth it? As good as S.P.I.R.I.T. Formula is, it's nothing compared to what it could be for You. It's nothing compared with the future - your future - after you feel confident, and raise your value, the World responds to you with appreciation and enhanced possibilities you truly deserve.